The first proposed restriction on short-term rentals in New Orleans hit a snag Tuesday when city planners said it was likely to create more problems than it would solve, but the proposed rezoning of the former Zara’s property in the Lower Garden District that prompted the proposal is still pressing forward with negotiations. Liz and Robbie Blum bought the former Zara’s grocery at 2042 Prytania Street in the July of 2014, and began extensive, 15-month renovations at the beginning of 2015. Because the business was closed during the renovation process, it lost its grandfathered permission to operate as a grocery on the residentially zoned property, so the Blums began the process of asking the city to rezone the parcel as commercial in 2017. Neighbors were generally supportive of the return of a grocery to the site, but some controversy arose over the use of the upstairs apartments as AirBnB short-term rentals. The problem was complicated by the fact that the mixed-use zoning that would allow the grocery to sell packaged liquor — which the owners said was essential to making the grocery financially viable — would also have also made short-term rentals permanently available there. In October, City Councilwoman LaToya Cantrell proposed a three-step compromise. First, rezone the property to neighborhood business, which would allow the grocery to return without alcohol sales or added short-term rentals. Second, change the definition of mixed-use zoning so that short-term rentals require separate permission from the City Council, instead of being automatically allowed. Third, rezone the property again to mixed-use, opening up the possibility of alcohol sales but governing the short-term rentals under the new, more restrictive definition. The first rezoning was approved, and the second and third parts were scheduled for their first hearing Tuesday before the City Planning Commission. The planning staff, however, argued that the change would actually make short-term rental licenses more difficult to obtain in these commercial zones than in residential areas, inadvertently incentivizing AirBnB owners to create more rentals in neighborhoods — the opposite of the Council’s intention in passing the regulations. “By discouraging short term rentals in these non-residential districts, it could encourage more short term rentals in nearby residential districts,” the planners wrote in their report (read it here). Another problem is that conditional uses for short-term rentals would remain with the properties, even if the larger classification of commercial short-term rentals were eliminated. The commission counted 162 commercial short-term rentals operating in the zoning districts in question, but said a better approach to reducing them would be to introduce geographic caps on the number of permits that can be issued. “A cap creates a predictable consistent regulation that directly targets the concerns with over concentration of short term rentals in a small area,” the report states. Ultimately, the staff argued, changes to the short-term rental regulations should be done after a generalized study, not in response to a perceived problem at a single property. 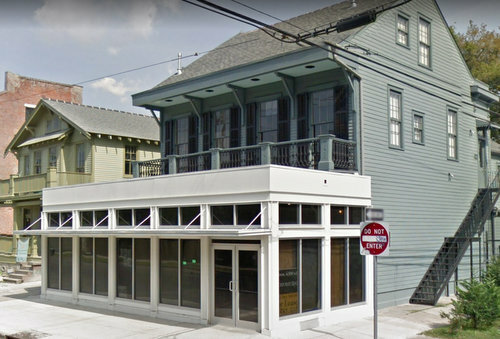 Meg Lousteau, director of the Vieux Carre property owners’ association, said she agreed that the change could unintentionally make the problems with short-term rentals a permanent right, instead of a privilege that can be revoked by future changes to the law. Without any additional discussion, the City Planning Commission agreed with the staff’s assessment and voted unanimously to recommend denial of the change to the City Council. Meanwhile, the third step in the Zara’s process was deferred for two weeks. Development consultant Nicole Webre told the commission that the owners and nearby residents are in the process of drafting a good-neighbor agreement about the use of the property, and that she’d like to have it in hand before presenting the zoning change to the commission. The commission staff noted that their recommendation is to deny the rezoning as well, as mixed-use is too intense a spot-zoning classification for that parcel. The good-neighbor agreement will not sway or have any impact on their recommendation, either, but because both the grocery and the neighbors were all requesting the deferral together, the commission agreed to hear the request in two weeks. After the meeting, Webre said the good-neighbor agreement under negotiation puts limits on the amount that the upstairs apartments will be used for short-term rentals, as well as other standard business issues like operating hours, trash pickup and deliveries. While the initial rezoning last October was intended to allow the owners to find a possible grocery tenant in the short-term, Webre said they have not had any luck, as everyone they have spoken with is waiting on the availability of alcohol sales. The profit margin on grocery items like fresh vegetables is simply too low to be viable without alcohol sales to help, Webre said. Both the change to the short-term rentals and the rezoning for the former Zara’s will head to the City Council for a final decision, where the City Planning Commission recommendation can be overruled. Thanks for covering these hearings Robert!